Over the past 10 years or so, there has been a remarkable increase of cask-conditioned ale (and lager) available in the Baltimore/Washington, D.C. area. Much has been good, but some not so much. That's a post for another time, but not today, because when a restaurant, for the first time, decides to serve cask-conditioned ale, and decides to serve it correctly, it should be an occasion to be celebrated. 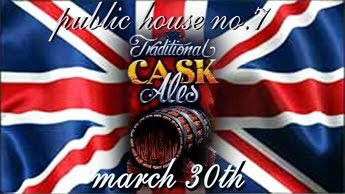 Such will be the case this Wednesday, 30 March at Public House No. 7 Tap Room & English Pub, in the 7 Corners area of Falls Church, Virginia. At 7pm, General Manager Patrick Blakely will tap a fresh firkin of Loose Cannon Hop3 IPA, especially prepared for him, with locally-grown hops, by the Heavy Seas Brewing Company of Baltimore, Maryland. And that will be the first pour from the pub's first-ever firkin. A firkin is a 10.8 gallon cask, containing real ale — beer so fresh, it's still fermenting when tapped. Loose Cannon, at 7.25% alcohol-by-volume, is a heavily hopped pale ale. The brewery states that it employs a triple hopping process to impart the ale with an aromatic, fruity aroma, rather than merely a tannic finish. I'll be on hand, as well as the local representative for the brewery, to answer questions about the beer, the brewery, and the process of cask-conditioning. UPDATE: Photos from the tapping: here. Happy birthday to the late Michael Jackson, born this day, in 1942. Like me, Jackson was of Lithuanian descent. Like me, he was a beer drinker. Unlike me, he was a great writer. Unlike me, he was an inveterate traveler. Jackson combined at least three of the four attributes as The Beer Hunter, bequeathing us a great body of written work on beer —and whisk(e)y and other things. His influence upon the perception of beer styles lives on. In fact the very notion of categorizing beer within styles, so debased today, began with Jackson. When Michael Jackson died in 2007, he had been suffering from Parkinson's Disease, as had my father. A film is in production honoring Jackson's legacy. Donating now to its completion will also help to fight Parkinson's Disease. We need your help to make Beer Hunter: The Movie a reality. Your donation of ten dollars - about the same as a six pack of good beer - will provide much-needed funds to kick start production on the film and corresponding series, The Last Beer Hunt. Ten percent of your donation will go towards establishing Pints for Parkinson's, a non-profit foundation aimed at preserving Michael's legacy while raising money for Parkinson's research and various local charities. Ten percent of all proceeds from the film will be donated to the Parkinson's Foundation. As a sponsor, your name will appear in the credits of the film and DVD, and you will receive a free download of the movie after its release. 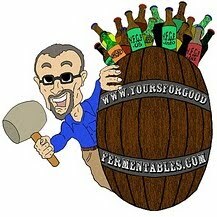 I was tipped to the film by Stan Hieronymous, at his blog, Appellation Beer. More posts on Michael Jackson, here on YFGF. More of my short list of Birthdays in Beer. 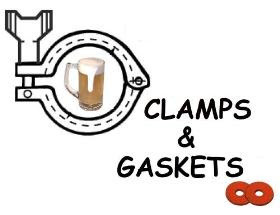 Follow the Brookston Beer Bulletin's comprehensive calendar of beer birthdays: a marvelous resource for learning more about the folk who brew beer, deliver it, serve it, drink it, and write and talk about it. DeGroens was once the brand name for beers brewed by the Baltimore Brewing Company, located in Baltimore, Maryland, just off its Inner Harbor. Opened in 1989 by Dutchman Theo DeGroen, the brewpub was well known for its German beer hall atmosphere, and for its German-style beers. Fans remember its Weizen (fresh yeast would be flown in annually from Weihenstephan Brewery in Freising, Germany), for its smoky Rauchbier (unique for its time in the US), its Marzen (many considered it a US benchmark for the Oktoberfest style), its Doppelbock (which garnered a gold medal at the 1995 Great American Beer Festival), and for its Pils (whose hop-drenched aroma and bracing bitterness was a revelation for many area drinkers). The brewery closed in late March of 2004. In the photo, taken in February of 2011, a customer at Mad Fox Brewing Company —a brewpub in Falls Church, Virginia— ponders what beer to fill his growler with. A growler is a resealable container, filled with fresh beer at a brewery or brewpub for customers to take home with them. In the US, many growlers are simple 2 quart jugs with screwcaps. The Baltimore Brewing Company was one of the first brewpubs in the US to use 2-liter growlers —importing them from Germany— sealed with a much more secure enclosure: a swing-top cap, gasket, and metal brace (similar to a Grolsch bottle). Not only could customers refill their growlers at the pub, they could exchange their empties for freshly filled growlers at 'DeGroens filling stations': select retail shops in Maryland. The brewery eventually added bottling facilities. Several years has passed since the brewery's demise, but the growler, above, still sports a DeGroens Pils label. 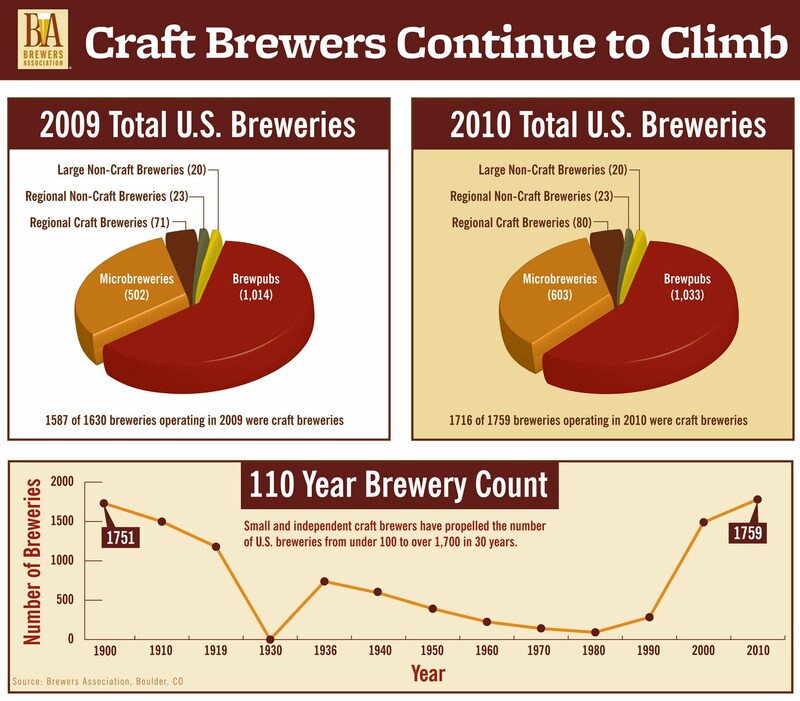 The Brewers Association (BA) —a trade group for American breweries and brewpubs producing 6 million barrels or fewer— has released preliminary figures for 'craft' beer sales in the US for 2010. Overall, the U.S. beer industry represented an estimated retail dollar value of $101 billion. U.S. beer sales were down approximately one percent, or 2 million barrels, in 2010 compared to being down 2.2 percent in 2009. Total beer industry barrels dropped to 203.6 million, down from 205.7 million barrels in 2009. Imports were up five percent in 2010, compared to being down 9.8 percent in 2009. The association defines a 'craft brewery' as small, independent, and traditional. Traditional: A brewer who has either an all malt flagship (the beer which represents the greatest volume among that brewers brands) or has at least 50 percent of its volume in either all malt beers or in beers which use adjuncts to enhance rather than lighten flavor. Last year, the Association came to grips with a looming problem. Several of its members were approaching the limit of the 'craft' brewery definition —2 million barrels or fewer. Any breweries past that limit would be kicked from the defined rolls of 'craft breweries', effectively punishing them for success. Boston Beer, the brewer of Sam Adams, was the most prominent. To deal with that, the Association increased the limit of its definition by 200%, from 2 million barrels to 6 million barrels. It will be interesting to see how much of the 2010 increase was from the largest 10 'craft' breweries, versus the remaining 1,749. The full report will be released on Thursday at the BA's Craft Brewers Conference. The entire press release can be seen at the BA's website: here. According to the Virginia Wine Board, Virginia is now home to 191 wineries. 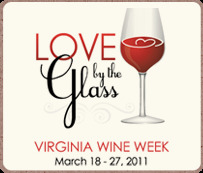 To celebrate, Virginia Wine Week began on Friday, 18 March, and continues through Sunday the 27th. Just as with some other beer and food weeks, that's creative calendaring. The 'week' is actually ten days, but it's more time to discover and enjoy Virginia wines. It is the perfect time to go out and sample what Virginia wines have to offer. "Virginia Wine Week: Love by the Glass offers visitors the best of our culinary experiences: restaurants offering local wines and food as part of their menus and hotels that make it easy to plan and visit our scenic countryside and wineries," said Mrs. Maureen McDonnell, First Lady of Virginia. "In addition, many of the white wines from our previous harvest are being released at the wineries during that time, an excellent time to get out and visit." The list of events is a little tricky to find. Click on the logo above. Find the "Filter by" box in the upper left of the page. Click on the drop down box labeled "Filter By Program." Scroll down to "2011 Spring Wine Week." Select to click, then click "Apply", and a page entitled "Where to Buy Virginia Wine" will appear. It's not exactly intuitive (why not provide a direct link? ), and what appears is only that —a list of shops, restaurants, and wineries at which to purchase Virgina wines. The effort is a start, however, and there are indeed many well-made and delicious wines produced in Virginia. Some of the wineries are quite small —nano-wineries, if you will. Virginia Wine Week could provide an opportunity for people to discover otherwise unknown gems. The website supplies other links to information on Virginia wine and wineries. For example, there are downloadable guides to all of Virginia wineries, and an interactive map with links to the state's AVAs (American Viticultural Areas). The Christian Heurich Brewing Company began brewing in Washington, D.C. in 1873. Eighty-three years later, in 1956, it would be the only brewery to remain in the Nation's Capital. Recognizing the futility of competing against the much larger national breweries, Heurich's board would vote that year to close the brewery and sell the property. Shortly thereafter, the Heurich brewery buildings would be razed to make room for a bridge over the Potomac River and the John F. Kennedy Center for the Performing Arts. A 'mere' six-hundred and sixty-two month-long gap would intervene before another production brewery, albeit smaller, would open in the nation's capital. Per Lagerheads of the Washington City Paper, St. Patrick's Day 2011 was an auspicious day. It's official. DC Brau is the first production brewery to operate inside the District of Columbia in more than 50 years. On Thursday [17 March 2011], founders Jeff Hancock and Brandon Skall received their Certificate of Occupancy... Today, [18 March 2011] the brewing begins. Public Ale, the small craft brewery's pale ale, will be the first brew out of the tanks... Public Ale cans and kegs should be available throughout the Metro area by the second or third week of April. This historic occasion follows another local brewing milestone. In February 2011, the Port City Brewing Company opened in Alexandria, Virginia, becoming the first production brewery to operate in that city —situated just across the Potomac River from Washington, D.C.— since the Robert Portner Brewing Company closed in 1916. Brandon Skall (r) of DC Brau talks with Bill Butcher (l) of Port City Brewing. The brewers at DC Brau have told me that "our first brew went well." A thirsty city waits! UPDATE: Photos from the public release party, 15 April 2011, for the ianugural brew: The Public Pale Ale. Heurich beers were again available in the greater Washington, D.C. area from 1986 until 2005. They were not brewed in the city, however, but in Utica, New York, by the F.X. Matt Brewing Company, under contract to Gary Heurich, Christian Heurich's grandson. Three additional production breweries have announced plans to open within D.C. in 2011: 3 Stars, Chocolate City, and Black Squirrel. The Washington City Paper's Lagerheads has the story. A fifth brewery, Logan-Shaw Brewing Company, is in the planning stages. At present, there are other breweries operating in Washington, D.C., but these are brewpubs, or restaurant-breweries. Capitol City Brewing Company, locally owned, was the first, opening in 1992, followed by the District Chophouse and Gordon-Biersch, both of which are franchise operations. A production brewery, by comparison, such as D.C. Brau, is not a restaurant; it produces its beer only for off-site sales, in bottles, cans, and/or kegs. In an American 'craft' beer scene awash with hoppy monsters, it's refreshing to taste a beer that celebrates the fermentable heart and soul of beer: malted barley. Above, a snifter filled with an American interpretation of a strong Scotch ale. Deep brown/red, unctuous, flavors of toffee, caramel, some roast and plummy fruit. Served cask-conditioned, 13 March 2011, at Mad Fox Brewing Company, in Falls Church, Virginia. Brewmaster and owner, Bill Madden, has won several medals for previous iterations of this Scotch ale recipe —at other breweries— including a gold at the former US Real Ale Festival, and a gold and silver at the Great American Beer Festival. Network for Good is a clearinghouse for contributing to NGOs involved in the rescue, emergency aid and shelter, and reconstruction in Japan, following yesterday's 8.9 magnitude earthquake and ensuing tsunami. The death and injury tolls are expected to exceed 10,000. The many organizations participating include OxFam, Save the Children, and Doctors Without Borders. 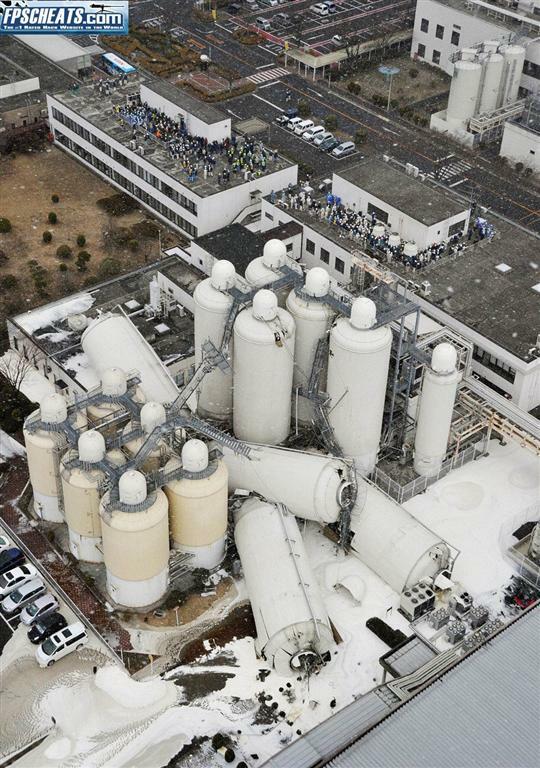 In this photo, evacuated brewery employees are pictured near the toppled tanks of the Kirin Brewery, in Sendai, Miyagi Prefecture, in northeastern Japan, the area hardest hit by the earthquake and tsunami. Photo courtesy of Reuters/Kyodo. 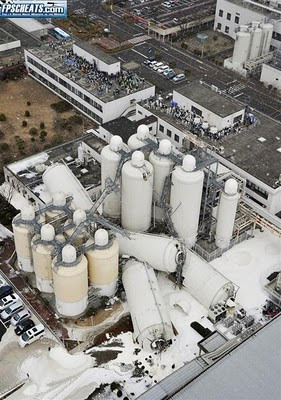 Japan’s breweries face uncertain future after disaster. Via BeerNews.org. Tipped to the photograph by Zythophile and A Good Beer Blog. In a stainless steel row, conical-bottomed uni-tanks hold beer in various stages of fermentation, in the cellars of Legend Brewing Company, in Richmond, Virginia. Developed in the early 20th century, the unitank is nearly ubiquitous in today's micro-breweries. The tank can hold fermenting beer in a sanitary, semi-sealed environment, as well as beer that is maturing and beer that is lagering at temperatures near 0 °C. The bottom 60° angled cone can collect yeast that settles from solution during and after fermentation. Those all-in-one features gave rise to the name unitank. The photo was taken at Legend on 27 February 2011, during festivities marking the brewery's 17th anniversary. This also marks a milestone for me. It's been twenty years now, and counting —17 January 1991— since I last consumed animal flesh. My 'last meal' was a New York Strip, with lotsa butter, —served 16 February 1991, at Ruth's Chris Steakhouse, off Dupont Circle in Washington D.C.— preceded by a Caesar Salad made table-side, with pulverized anchovies and whipped raw egg yolks. In the ensuing two decades, I've learned to avoid the terms vegan and vegetarian. I do NOT define myself as "Thomas, the vegetarian" just as I wouldn't as "Thomas, the blazer-wearing beer salesman." Labels can confound rather than clarify. 'Vegetarian' and 'vegan' imply things that I'm not, as opposed to things that I am. The term vegetarian is so often modified by exceptions that it has become rendered meaningless. After all, what's vegetable-ian about eating fish, as in pesco-vegetarian, or eating chicken eggs as in ovo-vegetarian? Is my decision a moral marker? No. Simply put, not eating animals is my dietary choice ... but there are other considerations. What’s gone wrong with food in the last hundred years has been a mixed bag of progress and self-destruction. There is no need for anyone in the world to go hungry; yet people do. There’s no reason for food to make us ill, either from chronic disease or communicable ones; yet it does. There’s no need for agriculture to poison the land, air, and water. All of these ills can be remedied, and yet it appears the situation worsens year-by-year. If eliminating animal from your diet is too daunting, reduce the amount and frequency. (Maybe avoid consuming animal on Thursdays, or Meatless Mondays, another US trend.) That's one beauty of avoiding the term vegetarian. You avoid any confusing preconceptions. VeggieDag Thursday recipe: Split Pea Soup with Oven-Smoked Tomatoes, hold the ham. A beer a day keeps the doctor away ... if you eat properly. Sweet and Sour Seitan and Vegetables, via Just Vegging Out. Chef Teddy Folkman of DC's Granville Moore demonstrates how to prepare perfect frites. Vegetarian croque monsieur: grilled cheese & mushroom terrine sandwich, at Central Michel Richard, Washington, D.C. It's almost time for the collegiate basketball championship tournament, colloquially known as March Madness. Mirroring that, the Washington Post Food Section conducts an annual Beer Madness Tournament. This year 64 US 'craft' beers were selected by the Post's beer writer, Greg Kitsock, and the beer director for the Neighborhood Restaurant Group, Greg Engert. The Gregs placed the beers into into four categories: Malt, Fruit & Spice, Roast, and Hops. I dig that: beers are judged according to broad flavor similarities rather than geographical mismatches. A panel of beer fans and beer professionals, including Kitsock and Engert, was selected to taste and judge the beers blind, that is, except for knowing the category, not knowing what the beers were. Similar to the basketball tournament, Beer Madness is not a round robin, but an elimination, the field whittled in half each successive week, until only one beer remains. By the 'Final Four' judges will be voting with stylistic preferences in mind, as beers from different categories will be facing each other. The first round eliminations will be announced by Kitsock on 16 March; the 'Sweet 16' on 23 March; and the 'Elite 8' on 30 March. The 'Final Four' will be announced on 6 April, which will pit the favorite in the Malt division versus the favorite in Fruit/Spice, and that of Hops versus Roast. The winners of those will then be judged against each other; the ultimate champion will be revealed on Wednesday, 13 April. Complaints about beer choices and beer omissions have been posted at the story. These miss the point of the exercise. Beer Madness is not the Great American Beer Festival; it's a fun diversion. And, by its very nature, it must exclude beers that are the freshest: draft beers from brewpubs. 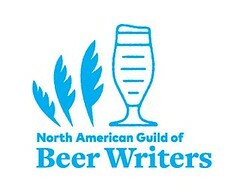 The few exceptions are from brewpubs close to the judging venue: Oliver Breweries, DuClaw Brewing, and The Brewer's Art. In a manner, the exercise mimics the manner in which real world beer judges —consumers— choose beers. They purchase those beers they favor; they don't bother with official style guidelines. Of course, to avoid brand favoritism in this case, the 'judges' tasted the beers without seeing the labels.